Concerts at SOAS always seem to have a good turn-out. Monday (19 November) was no exception when Choi Jin and colleagues presented a programme of modern compositions and arrangements of music for traditional Korean instruments. 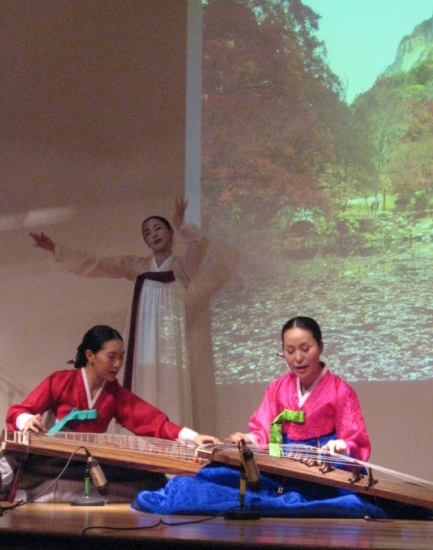 Keith Howard provided some informative introductions to the music to be performed, which provided useful context as well as some breathing space for Choi to slip into a different hanbok. 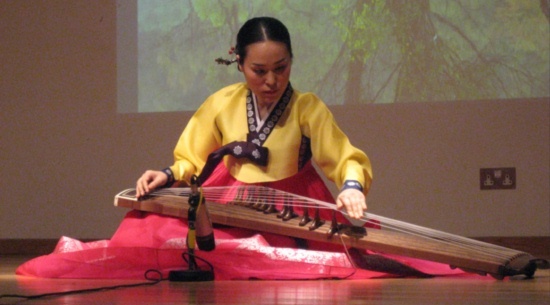 Professor Choi, who teaches at both Ewha Women’s University and Chung-ang University, started with Hwang Byung-ki’s Chimhyangmu for 12-string kayagum (top), probably the best-known modern composition for the instrument. It appears in the soundtrack to Dan Gordon’s documentary on the North Korean mass games (A State of Mind), and had two public performances in London last year. Less familiar was Choi’s second piece, Five-string Zither with Two Pitches by Lee Sung Chon. Choi arrived on stage with a 12-string kayagum, then ostentatiously removed the bridge from seven of the strings, almost playing to the audience as to which string she was going to decommission next (above). Despite the somewhat unpromising title, and the warning from both Keith Howard and the programme notes as to the complexity of the work and its controversial nature, the piece was highly approachable. 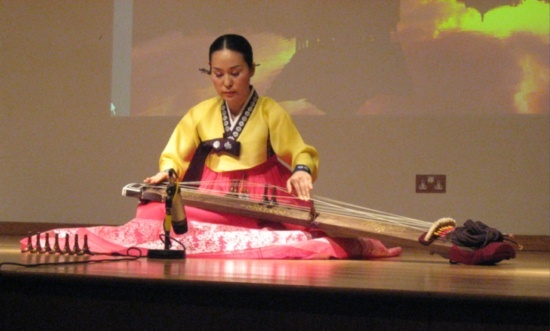 The third item on the programme, Sanhaeng by Kim Young Dong, introduced the daegeum flute (right), the yanggeum dulcimer (played by Choi – left) accompanied by 25-string kayageum. With the kayageum providing support almost like an alberti bass the melody was provided by the two other instruments. A very simple-sounding piece, and after what had come before it sounded rather lightweight. That could not be said of the next item on the programme, the arranged extract from the story of Chunhyang. For this Choi showed her versatility by singing pansori-style while providing kayagum accompaniment, while a dancer interpreted part of the story. Projected onto the back of the stage were scenes from Im Kwon-taek’s film (unfortunately squashed into a 4×3 aspect ratio, meaning that the characters were made tall and thin). Strangely, the projection showed edited highlights of the whole film rather than just the scene which was being performed on stage. The final piece on the programme provided the opportunities for all of the kayagum players to perform together. In an arrangement by Choi Ji Hye of a Choi Ok Sam style sanjo, Choi (on a traditional 12-string instrument) was supported by a quartet of 25-string instruments and changgo. The audience almost audibly breathed contentment at the harp-like opening. 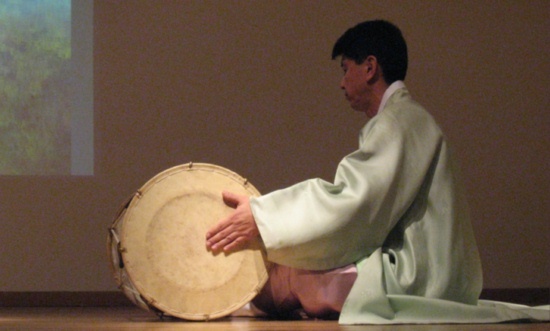 The accompaniment was extremely precisely coordinated, both by invisible communication between the players and by the occasional grunt of encouragement (chuimsae – 추임새) from the changgo player (below). This piece was warmly welcomed by the audience as it made the sometimes austere and impenetrable sanjo art-form readily accessible. As an encore, all the performers reunited on stage for some well received folk songs (including the ubiquitous Arirang), and at the exit the CDs for sale went like hot cakes.